Dave and I are huge hummus fans. We eat a quart of hummus just about every week. Our top favorites are this recipe for Green Herbed Hummus, Roasted Garlic Hummus, and Roasted Red Pepper Hummus (the classics, right?). We also rotate in Beet Hummus, Zucchini Hummus, and Broccoli Hummus when we need a break from the chickpeas. 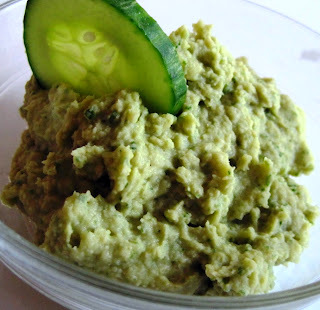 Hummus is a great snack or component to a fabulous lunch! Full of protein, good fats, antioxidants, it provides you with fuel! :) We’ll eat with zucchini and celery sticks or served over a bed of spinach. Mmm mmm good! In a food processor or blender, add all ingredients except olive oil. Pulse until slightly combined. Run on High speed and stream in olive oil until combined. Refrigerate 2 hours before serving to allow flavors to mix.